By Krista Baliko Posted: May 28, 2018 1:30 p.m.
Today, at Congress 2018, the Honourable Kirsty Duncan, federal Minister of Science and Minister of Sport and Persons with Disabilities, announced $158.4 million for 808 research projects across Canada. Funded through the Social Sciences and Humanities Research Council (SSHRC), the projects being supported range from education and immigration to Indigenous arts leadership and climate change. “Thanks to the work of the hundreds of researchers being recognized today, Canadians can gain a better understanding of the world we live in. It is my honour to support these talented researchers and help them push the boundaries of knowledge that will mean a better environment, better health, a better society, and a better economy for all Canadians,” says Duncan. Dr. Ted Hewitt, SSHRC President, was also part of this Congress 2018 event. “SSHRC-funded scholars and researchers can provide guidance on important societal changes. Through these projects, SSHRC is helping to develop talent and to connect Canadian and international researchers and partners across disciplines and sectors to support world-class research that provides critical insights on the challenges of today and tomorrow,” says Hewitt. 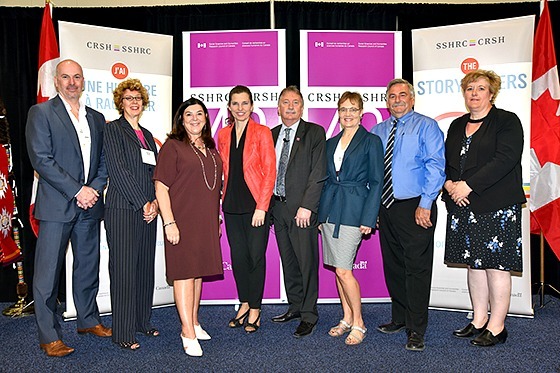 Dr. Vianne Timmons, University of Regina President and Vice-Chancellor, says SSHRC means a lot to many academics across the country as the federal funding body facilitates research that is crucial for our society. “SSHRC funding allows scholars – students and faculty – to ask the critical research questions that enable research we might not otherwise be able to undertake,” says Timmons. Dr. Margot Hurlbert and Dr. Sheila Petty are two University of Regina researchers whose projects are supported by the new SSHRC grants. Hurlbert, who received $245,045 for her project titled, Implementing community citizen engaged best management practices through adaptive management, says SSHRC’s support will help the research team focus on reducing vulnerability to climate change, specifically in relation to a community’s decisions respecting water management issues. Petty, a professor in the Faculty of Media, Art, and Performance (MAP), was awarded $79,167 for her project, A cinematic history of the origins and legacy of la marche pour l'egalite et contre la racisme in France. Not present at the event, but also a grant recipient, was MAP’s Dr. Francesco Freddolini (Luther College) who received $78,805 for his project, Regal alterities: imagining exotic rulers and ambassadors in early modern Europe. Members of the public are invited to join Dr. Vianne Timmons, President and Vice-Chancellor of the University of Regina and SSHRC-funded researcher, at a special free event that will bring together scholars to discuss obstacles and strategies for the recruitment and retention of faculty members from racialized and other equity-seeking groups in Canadian universities. The event takes place at the University of Regina on Tuesday, May 29 at 1:30 – 3:30 p.m. in the Centre for Kinesiology – Congress Hub – Expo Event Space.